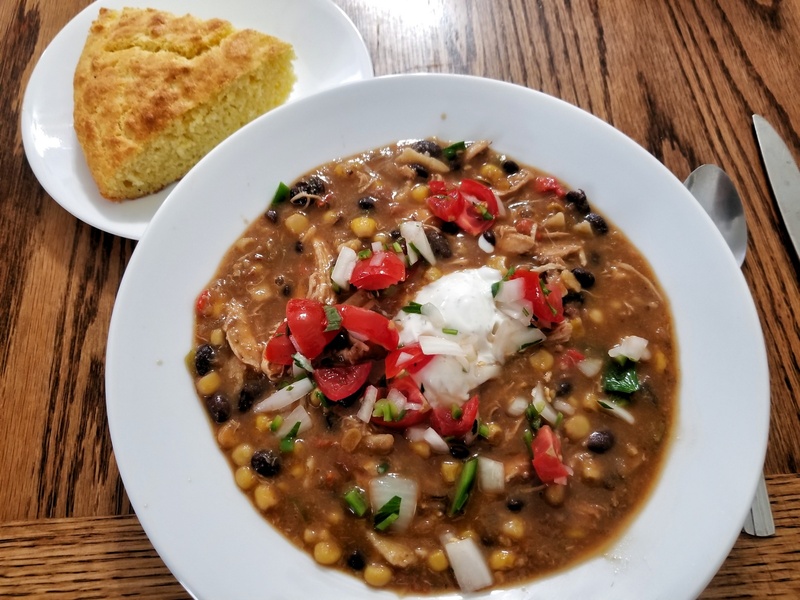 That tortilla soup with sour cream and pico garnishes and buttermilk cornbread. 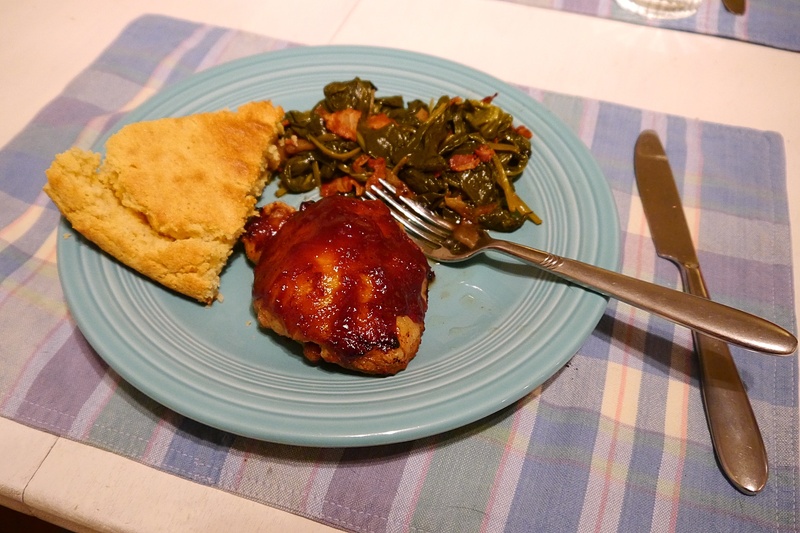 These went from dry to done in just a couple of hours thanks to the Instant Pot pressure cooker. It probably could have been done quicker but I was a little leery of the cooking tables. I have a vague memory of being disappointed in some pintos I cooked following their data. I decided to simmer them for an hour then give them an hour in the cooker. 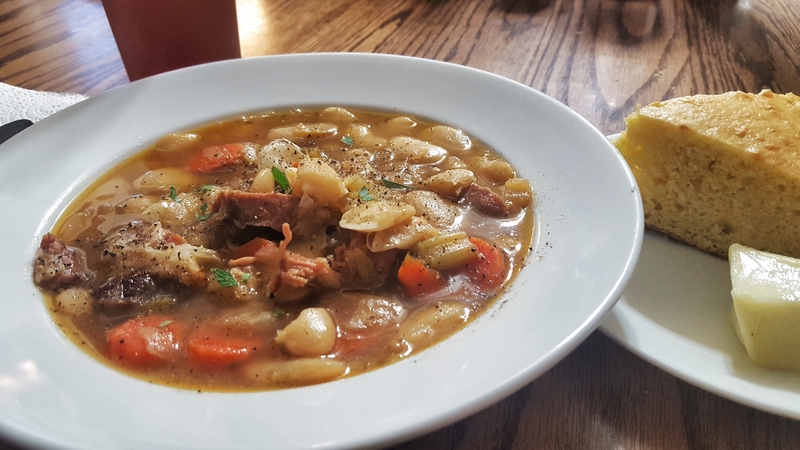 They cooked in chicken stock with a chopped onion, bay leaves, pepper, salt, dried thyme, and a couple chunks of cured ham. Don’t let anyone talk you into undercooking the beans when you make this, it’s not a stir fry. 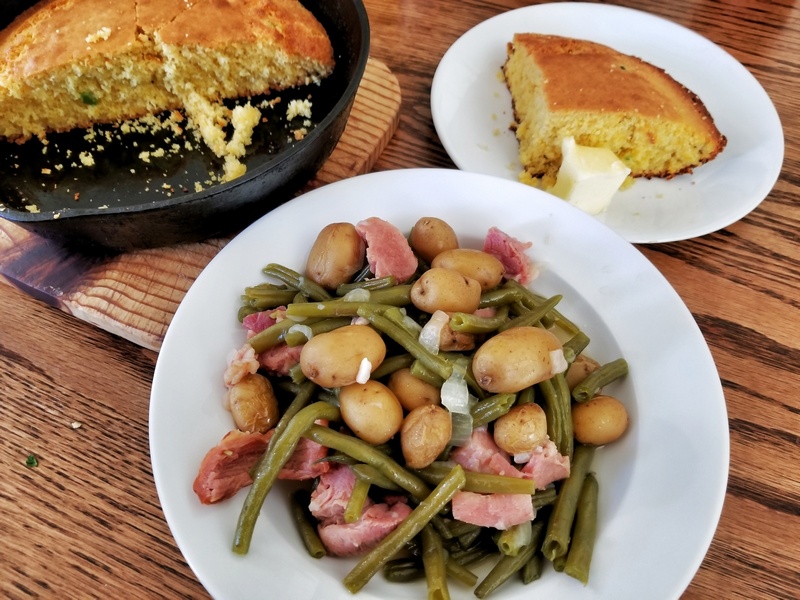 The cornbread has chopped jalapenos and shredded cheddar and it works for me as an accompaniment for the beans. We are fast approaching Thanksgiving and we’ve had our second hard freeze. The first time I carted the vulnerable jalapenos into the garage overnight but I didn’t this time. I combed through the wilting foliage for the last harvest. 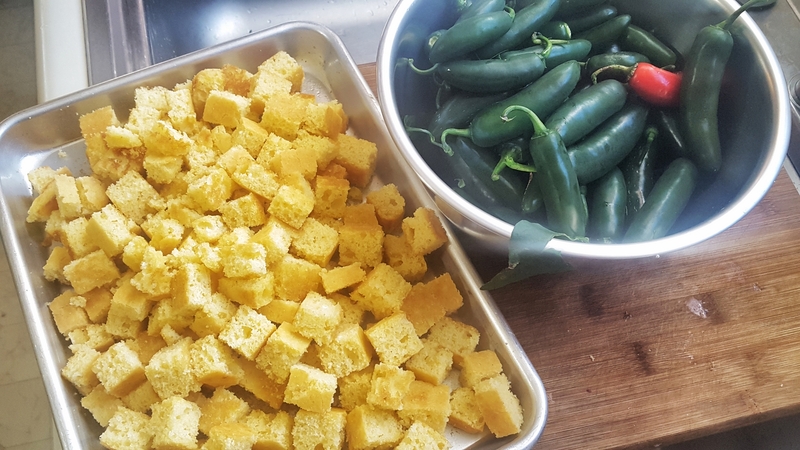 The cornbread cubes are drying in anticipation of making a dressing. I baked a loaf of plain white bread earlier and dried them in a low oven. 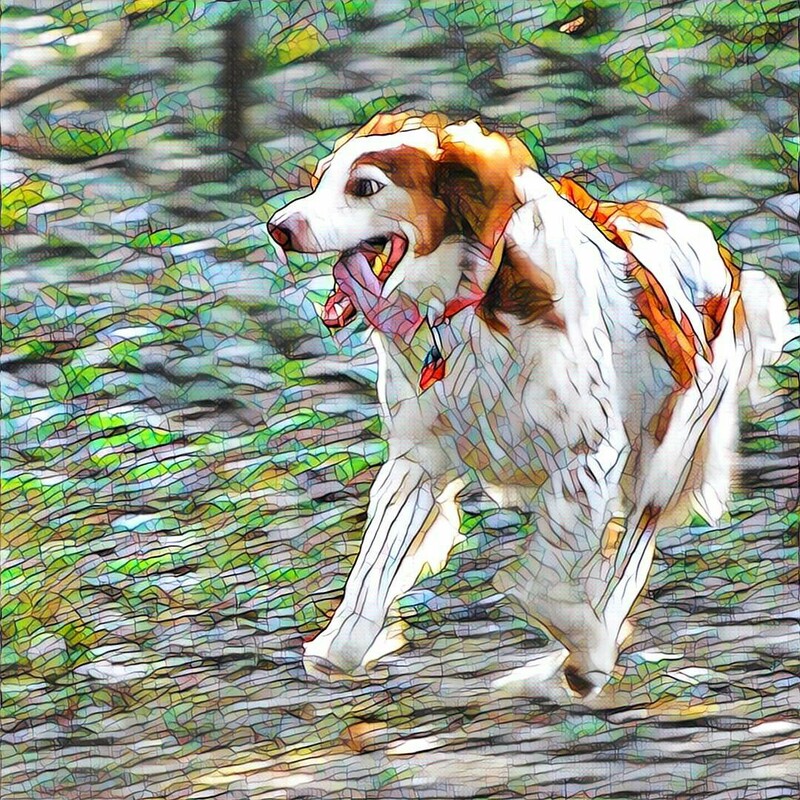 Here’s another treatment of the picture of Bea among the habaneros, it’s done with the “mosaic” filter in the Prisma app. 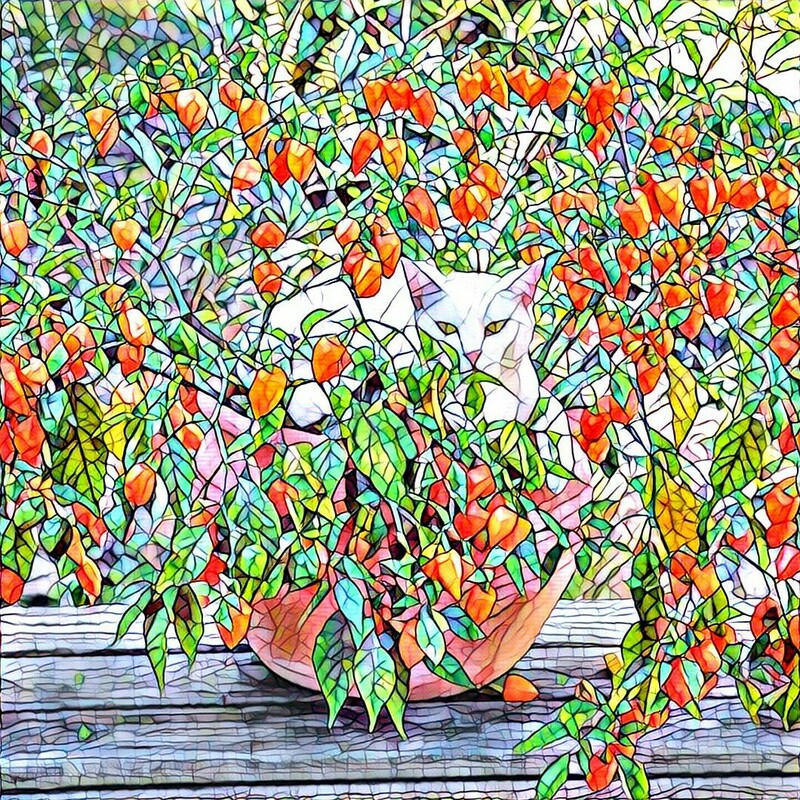 It most effective when there are a lot of discrete elements within the photo like the leaves and peppers in this one. 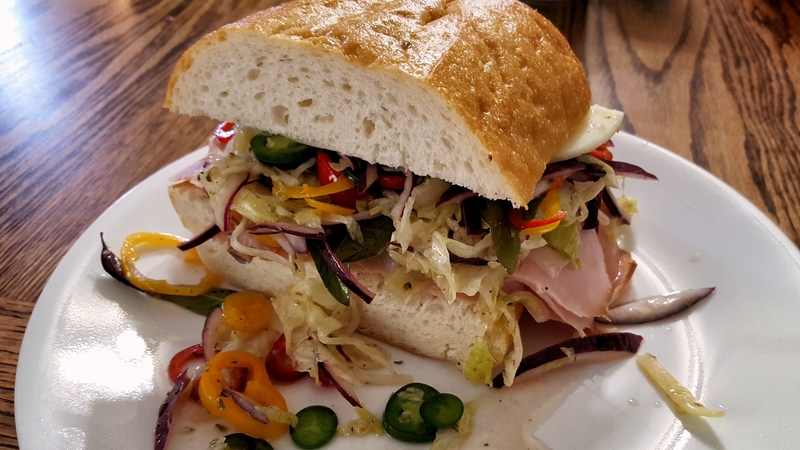 Sammich pr0n! 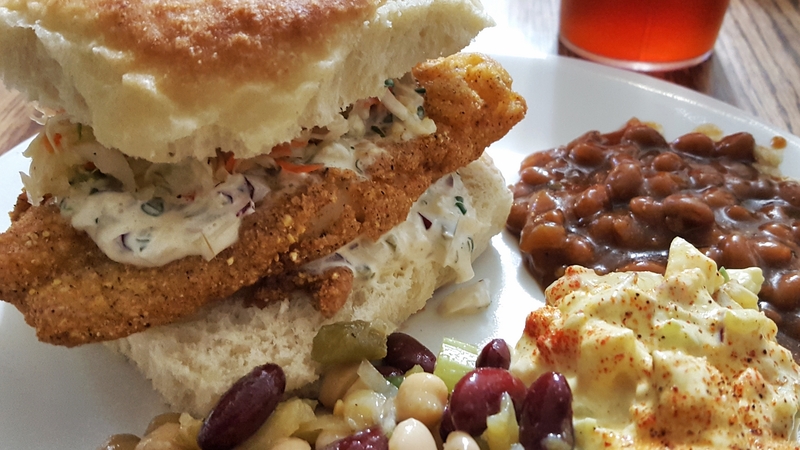 This is a cod fillet that had been dredged one time in a commercial fish breading that I added some coarser cornmeal to. I made a very busy tartar sauce of mayo, onions, chives, horseradish, jalapeno, lemon juice, salt and pepper – and topped that with slaw. 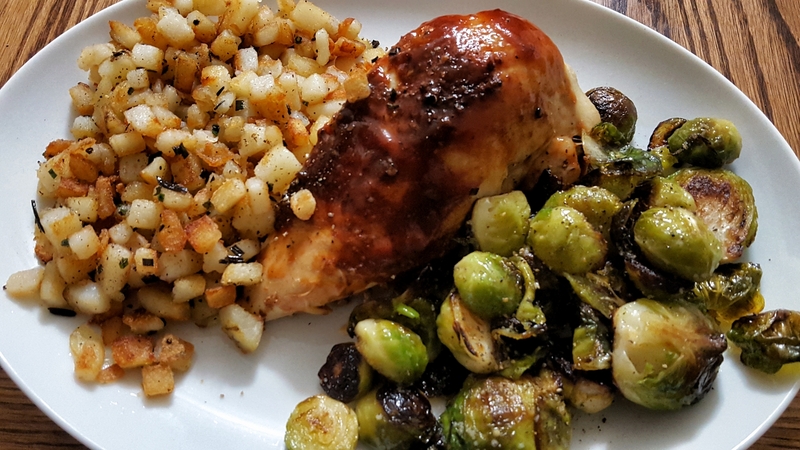 Here’s a chicken breast that was slow cooked in the toaster oven with my (current) favorite hot sides of fried potatoes and sauteed Brussels sprouts. 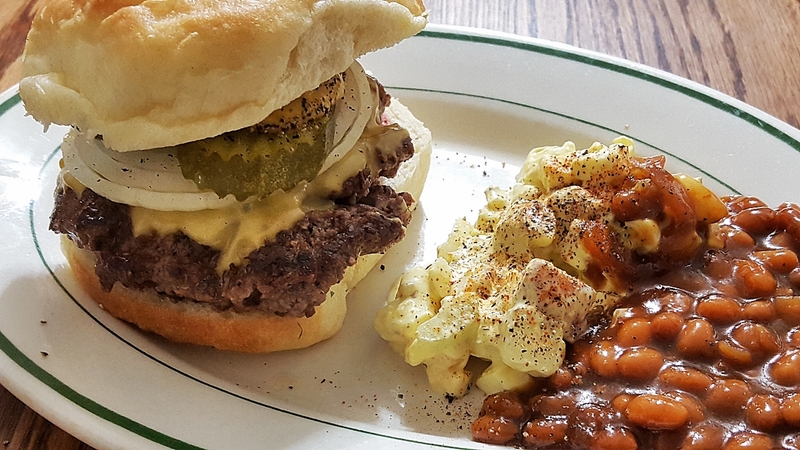 Just your basic cheeseburger – pickles, onions, mustard. Here’s that mosaic filter again. The algorithm that draws in the tiles has trouble with the motion blurred background. And that tongue! LOL I had the stub end of a loaf of Italian bread left over from making garlic bread to go with a small lasagna I made the other day. The lasagna was pretty good but I served it right out of the oven and the layers slipped and slid all over the plate in the bechamel/tomato sauce. Served it in a bowl, I could have called it soup. Ha Ha I meant to do that! 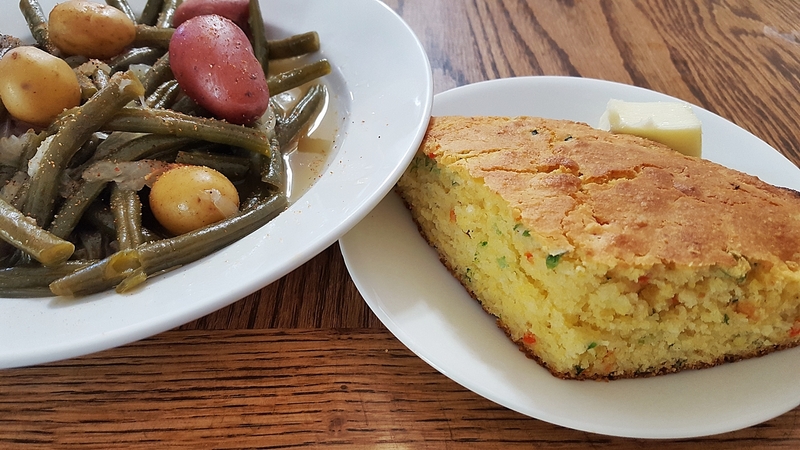 These are cooked for a long time over low heat – that’s what the “Southern Style” is all about. 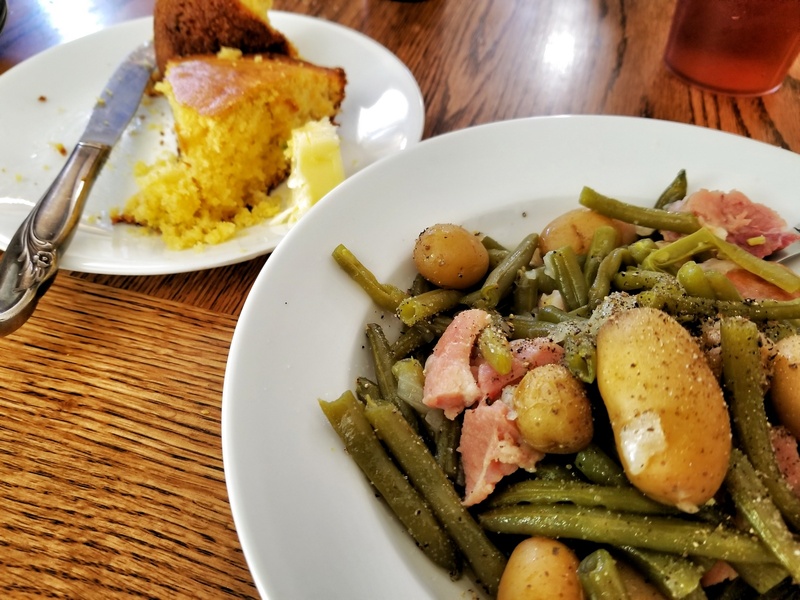 This dish today was cooked with a cured ham hock, one of those we travel an hour or so north to get from a meat processor there. This is part of one, it’s been simmering in water and stock with an onion for a couple of hours. I didn’t see any of these out on display the last trip and asked for a couple. They brought out two humongous hocks and my eyes nearly bugged out. The guy asked, helpfully, if I wanted them cut up some? I nodded yes and he took them to the saw and cut them each into three parts. 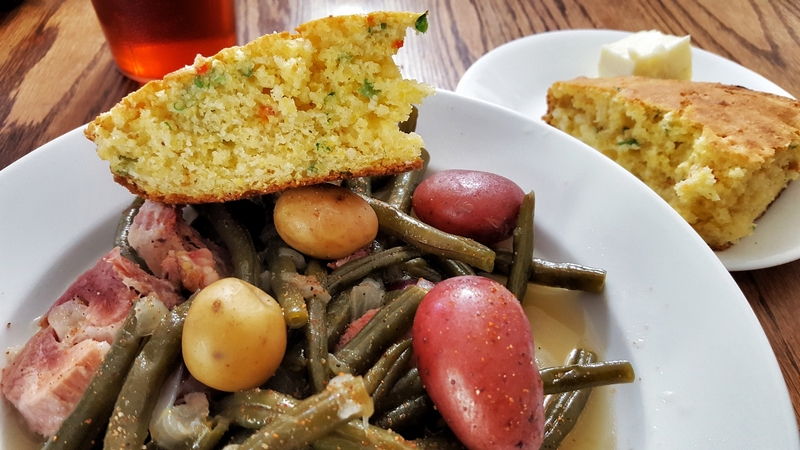 You have to make cornbread to eat with these beans – It Is Written. To cook these it’s not so much a recipe as much as a method. 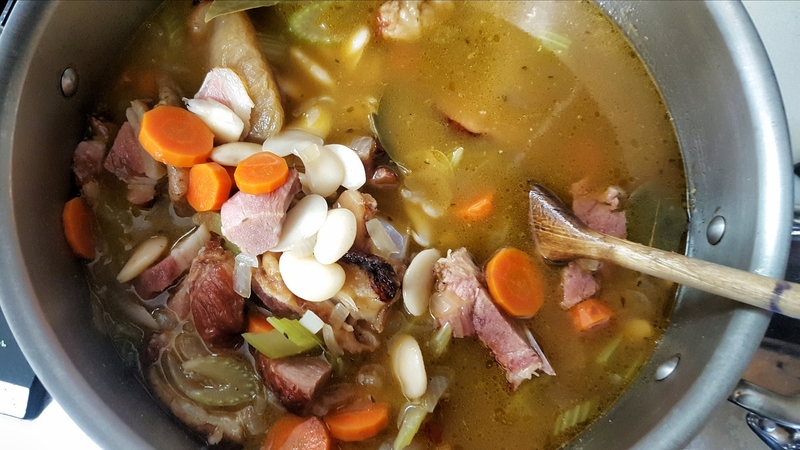 I start the hock early, then set it out to cool and add the beans to the water and chicken stock it simmered in. Bring them to a boil and then reduce to a simmer for a couple of hours. 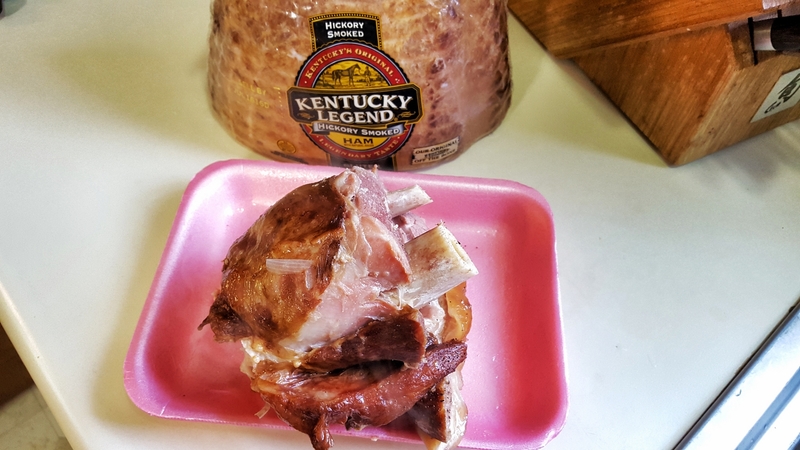 After the hock cools, remove the bones and skin and cut it up to add back, add potatoes a little later. Those little baby potatoes I used take about 45 minutes to cook at a simmer. I used salt, fresh ground black pepper, onion powder, cayenne pepper and granulated garlic to season these.